A lovely week in Herefordshire to recuperate after the madness of Holy Week. We spent our time in a delightful village called Weobley, in the equally delightful Mellington House. Alison & Chris were so helpful and friendly, and the self-catering cottage that we had was great - give them a visit if you're in that part of the country. Having done no running at all since the Sport Relief circuit, I was eager to get in even a little exercise. So on Tuesday and Wednesday evenings, after a day's gentle bimbling round local towns, shops and tourist attractions (click here for one of them), I headed out around the village: right down the main street to the church, round the bottom of the church, back up the other side and in to the top of the high street. FetchEveryone decreed this route to be 0.69 miles, so three loops gave me a two mile run. A really pleasant evening, and a pretty place to be. 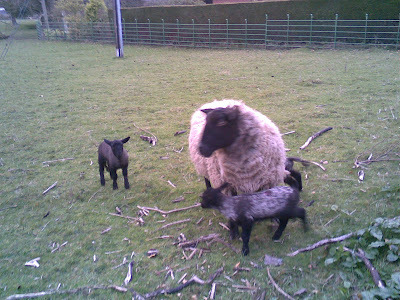 The ewe and her lambs looked at me as though I was mad. However, this took me back to (mostly) running on roads with minimal pavements. Which meant road camber. And by the end of the second run, I had to admit that the ankle was starting to ache again, and that was somewhere I just didn't want to go; so my two little evening runs were the sum total for the holiday. Roll on my next podiatry appointment.